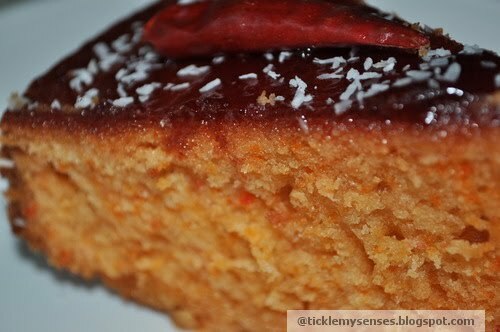 If you are living in a location where Iyengar bakeries do not operate , I promise you this recipe will not let you down.............with every honey laden bite into the soft sponge you will sing ......."sugar....ahh....honey honey....you are my candy and you got me wanting you".........tarararara..........Enjoy!! 1.Sieve the flour with the baking powder twice and then put into a large mixing bowl. 3. Pour into 21 cms cake tin which is preferably nonstick with a unlocking base, or any type tin would do. 4. Place in the center of oven and bake for 35- 40 minutes. Check with a skewer at 30 minutes, it should come out clean when insered into center of cake when done. 5. 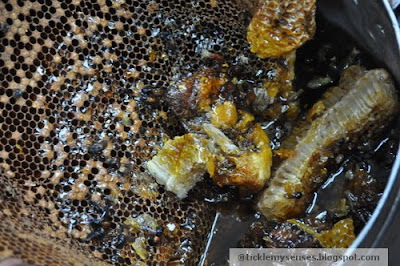 While cake is baking prepare the honey drizzle. Put all drizzle ingredients except rose water into a small saucepan and stir till sugar dissolved, allow to come to a rolling boil on a low flame till it becomes syrupy. Remove any scum that collects on the top. Add rose water. Keep aside to cool down. 6. 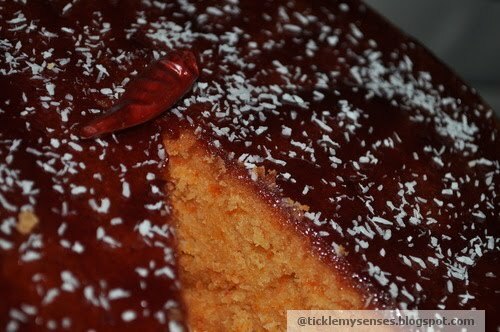 Once cake is done take out of oven, pierce all over with a toothpick. Pour the cooled syrup over the hot cake. 7. Prepare jam topping by placing jam and sugar in a small saucepan. Heat jam mixture gently till melted. 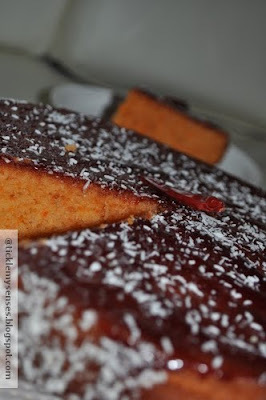 If making honey chilli cake add cayenne pepper and cook for 2-3 minutes more. Cool the topping before pouring over the top of the cake. Spread evenly. Scatter some grated coconut on the top of cake. Let the cake soak in all the lovely honey drizzle for 3-4 hrs. Serve at tea time or anytime , chilled or just as it is. mmmmm!! !its looks yummy and i'm sure it tastes great too. I Love honey cakes and dint find any good recipie as i expected.. Lucky i found yours. Great ingredients and superb instruction!! I cant wait to to try it. Thanks a lot for posting. Dear Sudha....thankyou for stopping by and for your lovely comment....I hope you enjoy the cake!